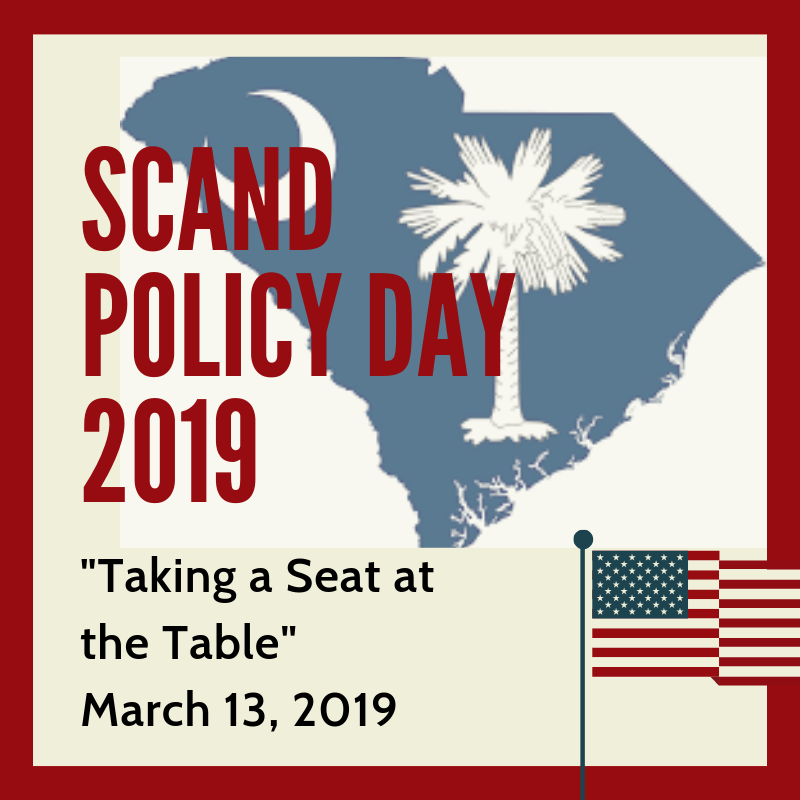 "Taking a Seat at the Table"
Join us on Wednesday March 13, 2019 for the annual SCAND Policy Day as this year we focus on "Taking a Seat at the Table". Topics for the day highlight the importance of advocating for our profession and those we serve by "Taking a Seat at the Table" to provide our expertise and guidance as important nutrition policy decision are made. We will hear from our Policy Partners Coordinator, Julia Terese on how to build relationships with legislators to put us at the table for conversations on nutrition policy. Clemson University will be speaking on their programs to improve food security and malnutrition in rural areas. Nina Crowley will be introducing a new initiative focused on interdisciplinary advocacy to improve obesity care access. Jeremy Ponds, Reimbursement Representative, will update the group on the latest progress on reimbursement for RDN services. Participants will have two opportunities to visit to the State House to meet with both our Senators and Representatives. 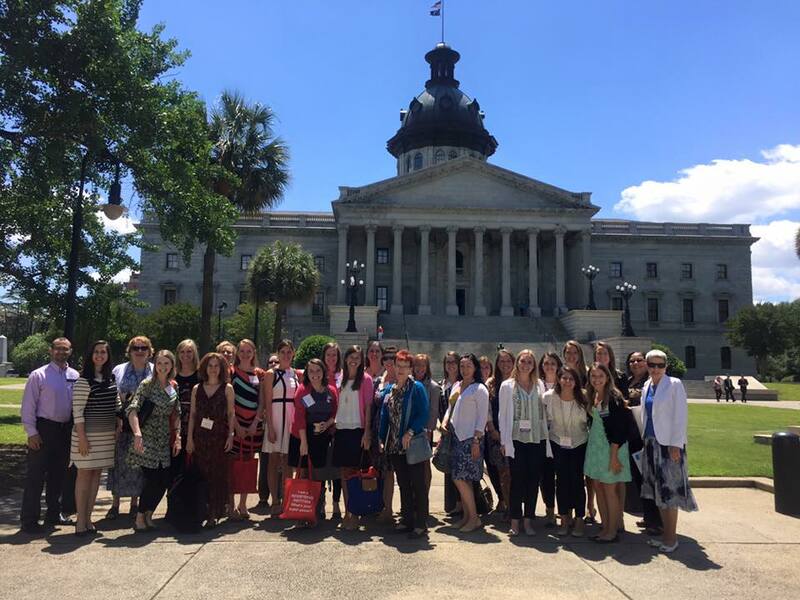 Involvement in public policy is vital to the health of our profession, and it affects every dietitian in our state! The purpose of policy day is to educate our members (whether you are a beginner or an expert) about nutrition policy, and how you can affect change! More importantly, we take one day every year to reach out to our legislators and let them know about the important role that dietitians play and why we are good to know! 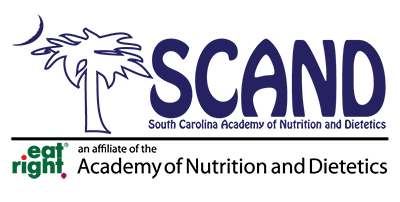 Consider taking this day to network with other RDs, get continuing education credit, and meet the people making decisions in our state that impact your profession. Each year the SCAND Public Policy Panel plans a day for members to interact with their legislators and learn more about public policy. In the past we have called it ‘Legislative Day’, ‘Advocacy Day’, and most recently ‘Policy Day’. 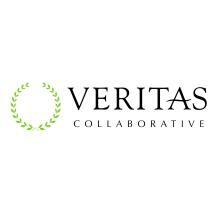 Typically we offer informative presentations that will help you get comfortable with the basics of public policy, licensure updates, and the importance of reporting harm. We generally go to the statehouse and informally call out members to introduce ourselves, our profession, and let our state senators and representatives know how we can help them! 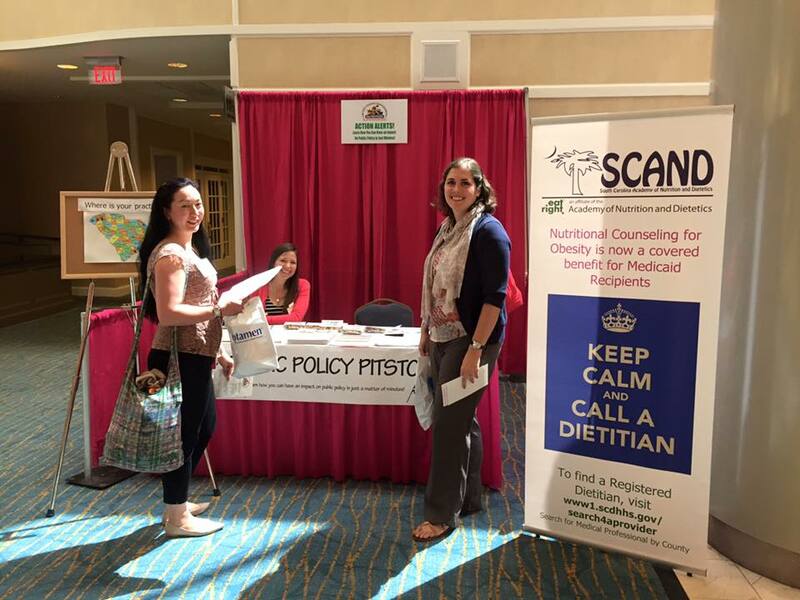 In both 2015 and 2016, the Policy Panel decided to put most of our policy programming on Wednesday of the Annual meeting to get more Dietitians exposed to public policy. Interest in public policy had grown therefore, in 2017, we went back to having a day solely dedicated to Policy. In 2018 Policy Day was held on Wednesday, March 14th, 2018 at the beautiful Palmetto Club. 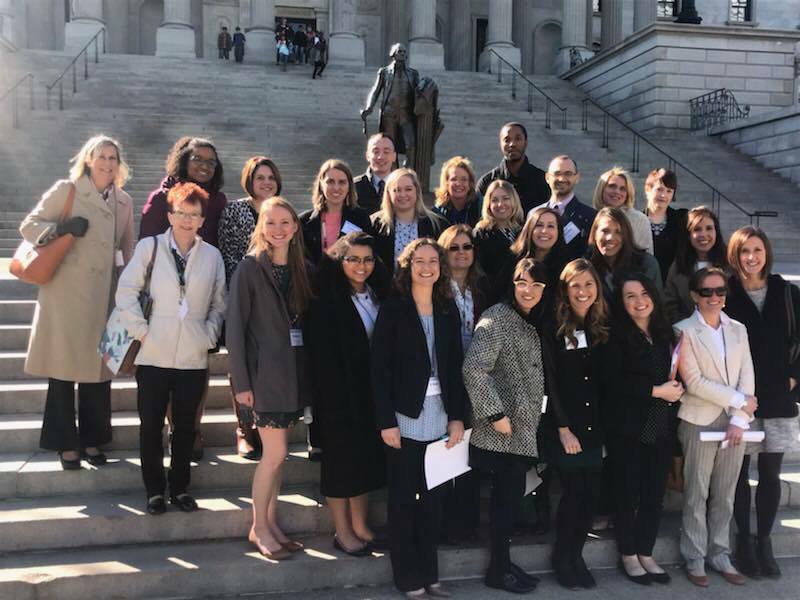 This year attendees had the opportunity to go to the State House to meet with their senators and introduce them to the role of the Registered Dietitian in their district. The house side was dismissed early for all their hard work on finalizing the budget. In addition to our advocacy efforts at the State House, we also heard from speakers on various policy related issues. First Katherine Shavo, Consumer Protection Coordinator, discussed tools for protecting the consumer, when and how to report harm and our duty as RDN's to protect the public. Julia Terese, Policy Partners Coordinator, shared how to communicate and build relationships with representatives. Adrian Grimes from MUSC educated the group on the South Carolina Telehealth Alliance and dietitian coverage for telenutrtion services across the state. Jeremy Ponds, Reimbursement Representative provided us with the how to of credentialing, enrollment and reimbursement for the RDN. And to conclude our educational presentations, Deborah Munchemeyer from SCDHHS, provided updates to the Healthy Connections Medicaid program including plans to expand dietitian counseling claims for beneficiaries. 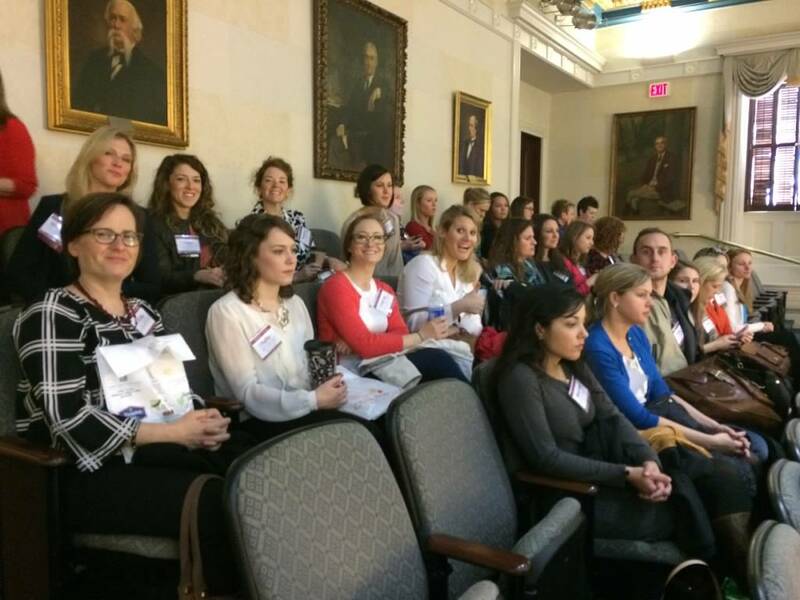 On March 8th 2017, 22 dietitians and interns from across the state joined to make an Impact! 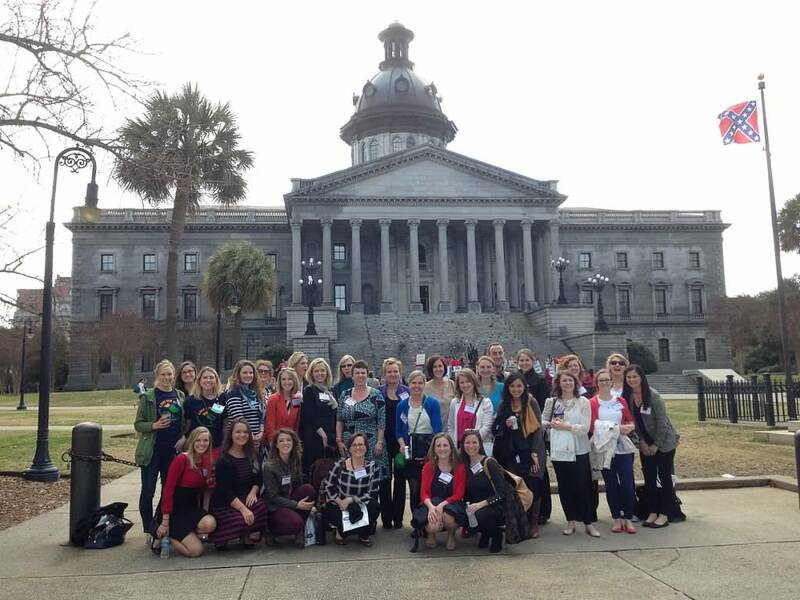 Together we walked to the SC Statehouse where many participants met with district Representatives (see photos below). 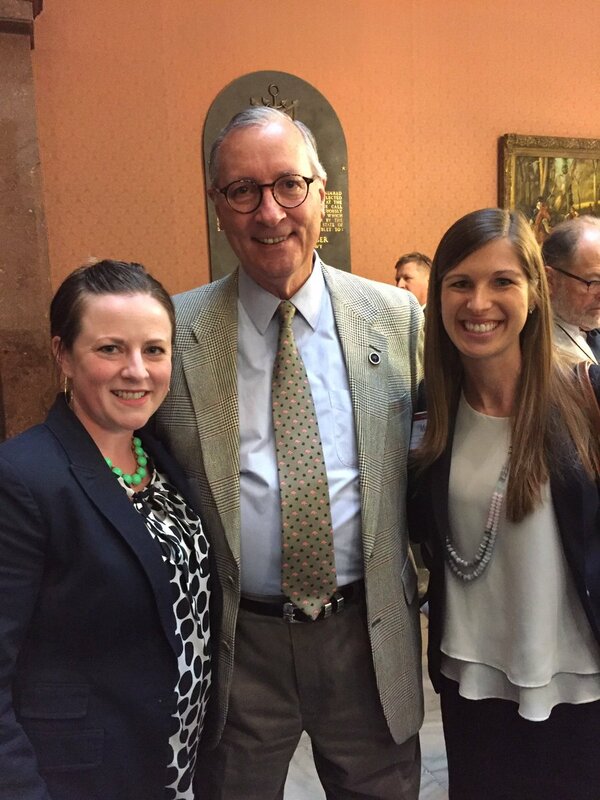 As we watched the house session from the balcony, Rep. Leon Stavrinakis (D-Charleston) addressed us, recognizing NNM and RDN Day and thanked us for our work in making South Carolina healthier! On the way out we stopped by Governor Henry McMaster's office where we received two proclamations designating March National Nutrition Month and March 8th Registered Dietitian Nutritionist Day across the state. 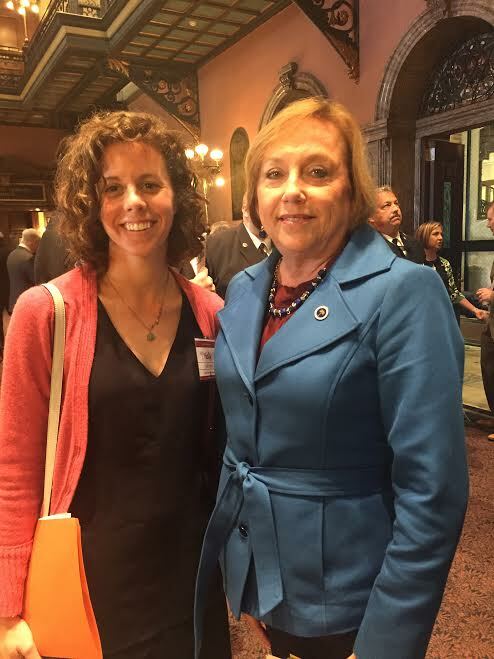 In addition to the visit at the SC Statehouse, attendees heard from speakers that impact nutrition practice throughout SC. To kick the day off, Charlotte Caperton-Kilburn, (Delegate) provided an update on the changes to therapeutic diet order regulation verbiage. We are very lucky to have her at the table advocating for our profession on these regulations that would have a big impacton practice. Then Ashley Thomas (Past-PPPC) shared how to become a policy partner and how to develop relationships with legislators. In the afternoon Rozalynn Goodwin with South Carolina Hospital Association presented us with her work in developing the Healtheir State House Initiative, promoting healthy lifestyles for our legislators and thier offices. Next we heard from Amanda Williams with SC Department of Health and Human Services on the progress of the Obesity Initiative and provided feedback on how to improve patient access to dietitians and dietitian enrollment. Finally, we heard from Dr. Janice Key. She presented her research and work with SC Medical Association Childhood Obesity Task Force making an impact on childhood obesity! In 2016, the policy panel worked hard to engage more members in the Public Policy Partners Program, and offered a pre-meeting webinar for Continuing Education 2 weeks prior to the annual meeting. 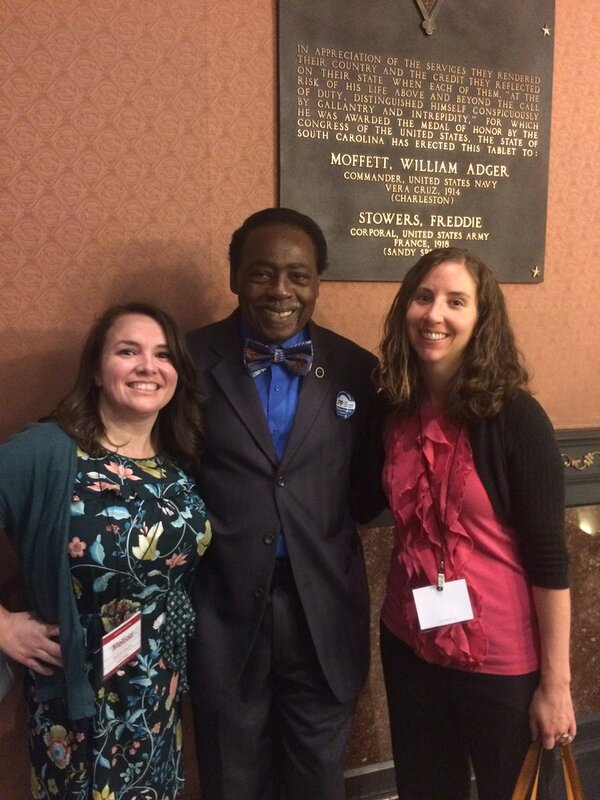 Nina Crowley (Past-Public Policy Coordinator) Kristen Quisenberry (Past- State Policy Representative) and Ashley Thomas (Past- Public Policy Partners (PPP) Coordinator) introduced SCAND policy initiatives and what PPP is all about, and outlined our plans for visiting the statehouse during lunchtime. About 30 RDs and Interns walked to the statehouse to check out the sessions, call legislators out to have a brief introductory conversation and photo/social media opportunity, and attended informal presentations on policy in the conference room at the statehouse. 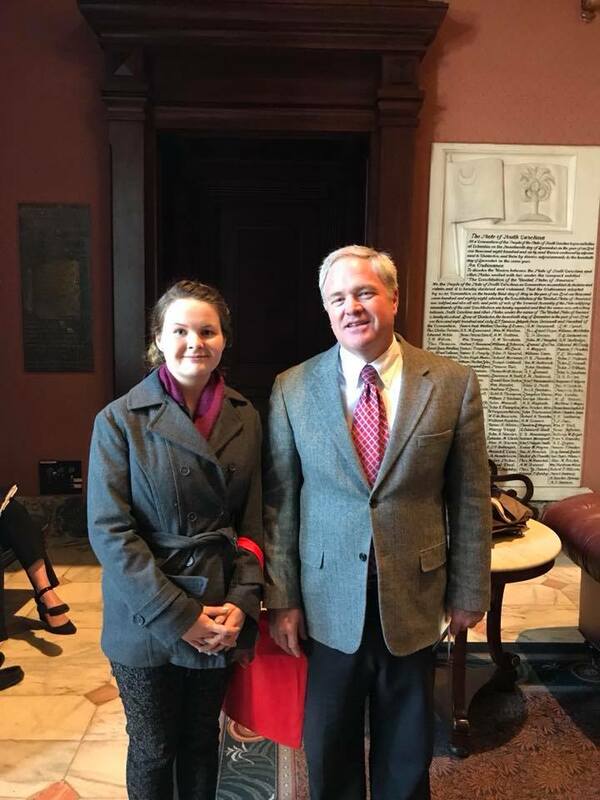 We spoke with MUSC’s legislative aide about the nutrition policy climate, the role of lobbyists, and how to talk to legislators. 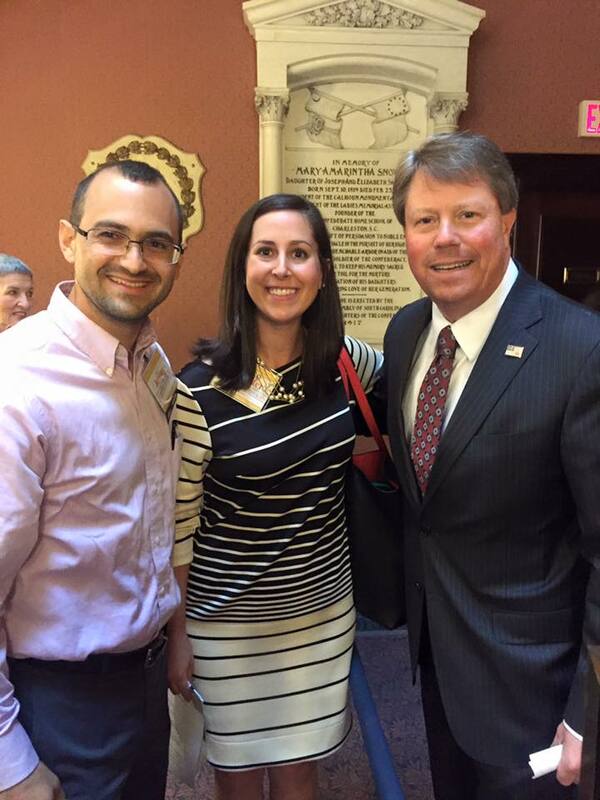 Jennifer Schlub and Jeremy Ponds meet with Rep. Chip Huggins (R-Lexington). Dr. Kathy Mercer meet with Rep. Chris Hart (D-Richland). Kristen Quisenberry helps RDs do Action Alerts, and sign up to be a Public Policy Partner at our ‘Public Policy Pitstop’ Booth! In addition to our educational sessions, 29 RDs/students/interns walked to the SC Statehouse to tour and visit our legislators. We picked up the Governor’s proclamation declaring March to be National Nutrition Month and March 11 to be Registered Dietitian Nutritionist Day. We watched our legislators in session and were excited to have Representative Peter McCoy tell the group that it was NNM and to thank us for being there! 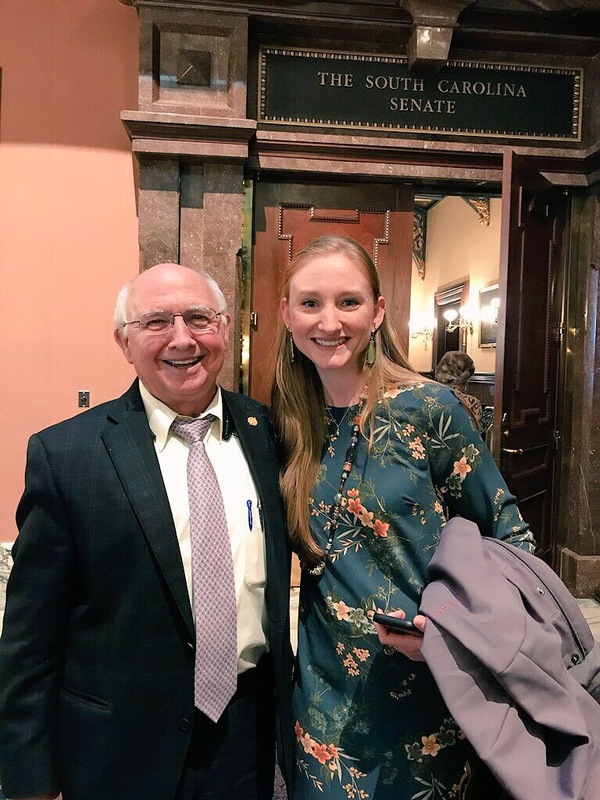 Some of the group met with their legislators and we have connected with them on social media, so check out the pictures! 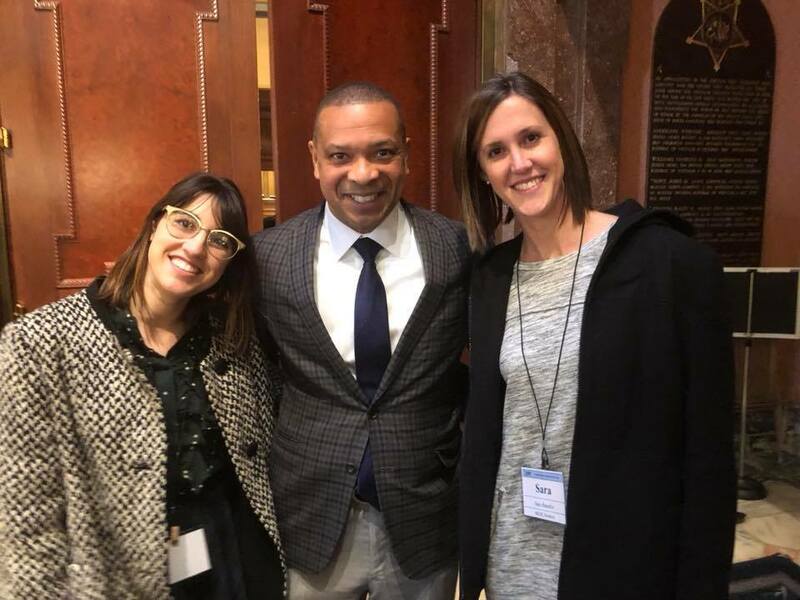 We started the day with Lisa Eaton Wright, MS, RDN, LDN, the immediate past chair of the Academy’s Legislative and Public Policy Committee (LPPC), who talked about “Policy Schmolicy” and she got us revved up to get INFORMED, CONNECTED, and INVOLVED! She gave a compelling argument for why RDNs need to be thinking of public policy, and a great way to get involved in SC is to sign up to become a Public Policy Partner. Meredith Alger, MS, RDN, LD, a Masters in Healthcare Administration student at MUSC and RD, showed us “the Business Case for RDNs in Value Based Health Care”. Meredith presented us with the much needed shift in healthcare to looking at values that matter most to patients! She reminded us how important it is to demonstrate our value and outcomes in the nutrition care we provide. Carrie Draper, MSW, presented on “SNAP Healthy Incentives Programs in SC” and outlined the Supplemental Nutrition Assistance Program and gave our members a much needed update on what ‘Healthy Incentives’ are to encourage produce consumption among SNAP recipients. Donna Quirk, MBA, RDN, LD, a self-proclaimed NIRD (Nutrition Informatics RD) shared her expertise on “Practicing Nutrition in a Digital World - Advancing Practice with Nutrition Informatics” and reminded us how nutrition informatics relates to all areas of our practice and showed us how regulations, standards, and technology are transforming healthcare. Finally, we had 2 sessions from the folks at SC Department of Health and Human Services. Megan Old, the Project Manager for the Obesity Initiative, gave an update on the proposed initiative that would reimburse Licensed Dietitians for counseling obese Medicaid beneficiaries (both adults and children in individual and group settings). We were also excited to hear from Dustin Welch and Kate Reynolds, from SC DHHS Healthy Connections Prime, a program for the dually eligible Medicare & Medicaid population. 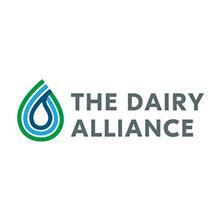 They are working to build their network of Dietitians to provide a variety of nutrition services to their patients. This program is patient-centered and they are open to reimbursement for a variety of services. For both the Obesity Initiative and Healthy Connections Prime, you need to enroll as a Medicaid Enrolled Provider. Act now by using the link available at: https://providerservices.scdhhs.gov/ProviderEnrollmentWeb/, and if you are a hospital dietitian, work with your hospital to take advantage of the waived group enrollment fee! 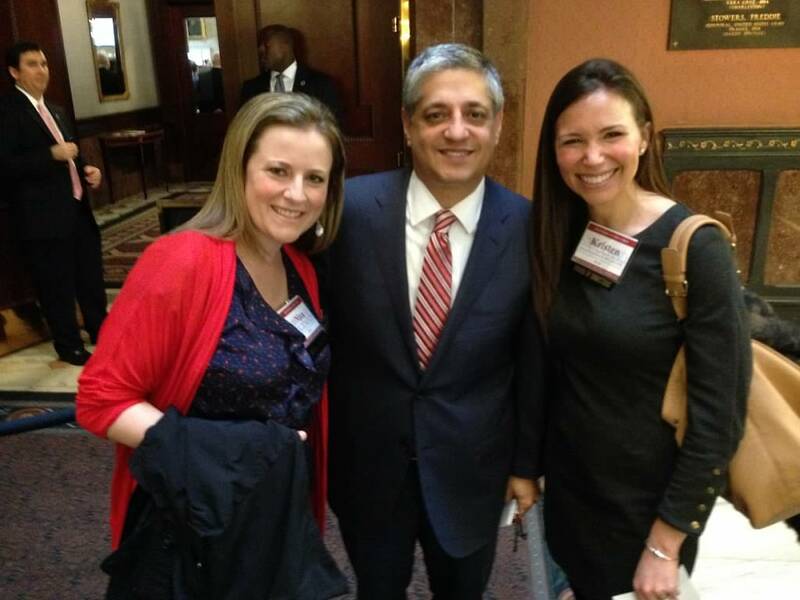 SCAND Annual Meeting 2015 - Charleston RDs Nina Crowley (PPC) and Kristen Quisenberry (SPR) with Rep Leon Stavrinakis (D-Charleston). 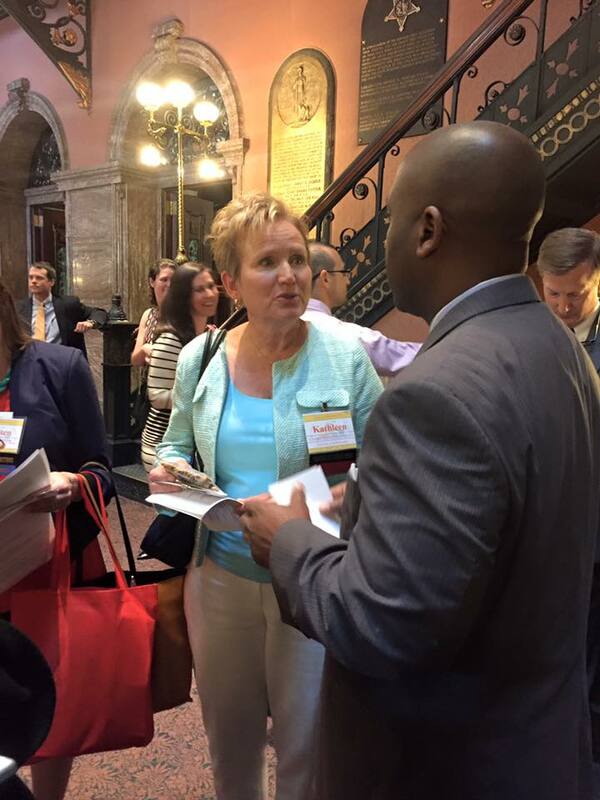 SCAND Annual Meeting 2015 - RDs at the statehouse getting introduced by Rep. Peter McCoy (R-Charleston).